Recently, I wrote about the “Almost Perfect Sales Management Article.” That post stimulated a flurry of questions about a Sales Management Standard Operating Process/System. I though I’d start to address that here. 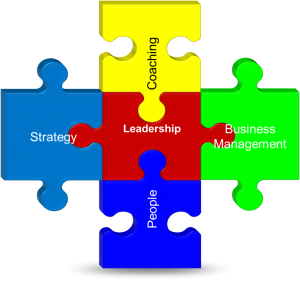 There are a few key building blocks to the Sales Management/Leadership Process. They are tightly interrelated–that is none can exist in isolation and all must be in place to drive the highest levels of performance both of the Sales Leadership team and the organization. Within each of these major building blocks there are a large number of sub components. As you would expect, these sub components are closely interrelated, both within their building block (say Business Management) and across building blocks. Leadership: In the leadership category, we tend to focus on defining the roles of executives and managers, the role of the sales executive in the overall organization, defining leadership development, and shaping the culture of the sales organization. Sales Strategy: In the sales strategy category, we focus on how the company wants to position itself and be perceived within it’s target markets and by prospects and customers. We address issues of the overall customer experience, the sales deployment and go to market strategies, organizational structure, overall goals and metrics, positioning with competition, overall cost of selling and the value of the sales organization within the organization. Business Management: Business management translates the Leadership and Sales Strategies into the implementation and execution of those strategies. Sales deployment models get translated directly into coverage models, channel, account, territory development, sales process, funnel/pipeline management, opportunity management, forecasting, systems, tools, programs, training, compensation and incentive systems, metrics, and other areas. People: This category focuses on getting and developing the right people in place to execute the sales strategies. We look at defining roles and responsibilities, performance management systems, recruiting, interviewing, hiring, on boarding, dealing with problem employees, people development, career pathing, and other areas. Coaching focuses on the role of the manager in providing day to day coaching. Some integrate this into the people component of the overall Sales Management Process. I prefer to keep it separate since it is such a key part of the manager’s job, but often tends to be poorly executed. Keeping it as a distinctive building block to the process helps maintain management focus. In this category, we look at coaching the fundamental components of sales performance. For example, coaching calls, opportunities, the pipeline, accounts, territories and overall performance. So the Sales Management Operating System provides the foundation for the strategies, priorities, tactics, and execution of the organization. Too often, however, leaders get consumed with one component, neglecting the others. Inevitably, this creates problems in the effectiveness of the organization. For example, we focus too much on the Business Management component, neglecting Strategy, overtime the sales strategies become outdated and uncompetitive. Or we focus on Strategy, neglecting to Coach and develop our people. Top performing Sales Leaders realize that driving growth and performance in the organization requires nimbleness–balancing all aspects of the job. Note: This blog post is from one of our featured guest bloggers, David Brock. The post can also be found on Dave’s blog here.